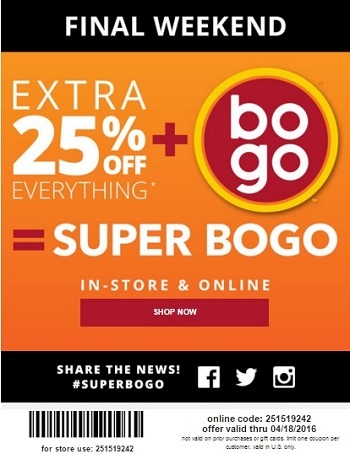 Have you ever heard about Super BOGO? If not, read this. Visit your nearest Payless ShoeSource store location and buy one item get the second one with discount + take an extra 25% off your entire purchase! This is Super BOGO! Do no hesitate and go shopping, still 2 days left to enjoy the offer. Source of the information is Payless ShoeSource. Offer expires April 18, 2016. For more details about the offer visit your nearest store location or official website.